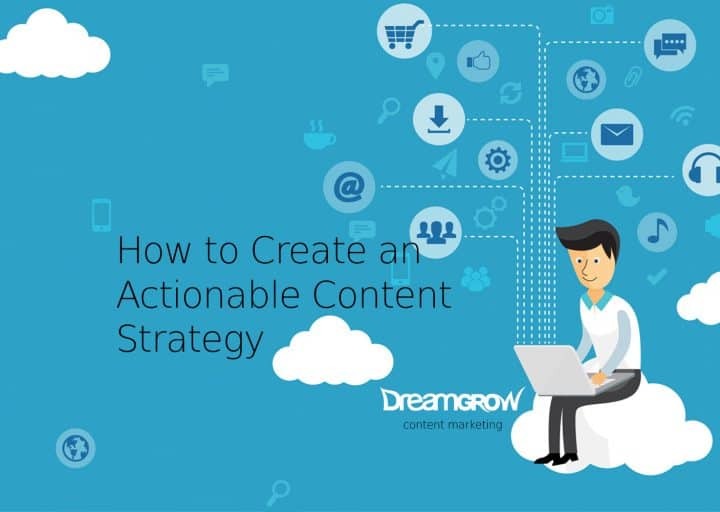 This guide will give you the necessary steps to create an actionable content strategy. Content marketing can quickly become your most valuable area for attracting new leads and customers. We will explore different stages of a content marketing strategy, and help you get from point A to point Z in just a few simple steps. Content marketing is the most popular free marketing technique for acquiring new customers. Numerous case studies conclude that content marketing excels in attracting customers, increasing email subscriptions by up to 1000%, and helps to establish trustworthy brand signals for future opportunities in advertising and business growth. Content ties together the community-driven aspects of your business brand. Having content that regular visitors and customers can relate to, increases their interest in you as a brand that operates on educational, but strategic, content basis. 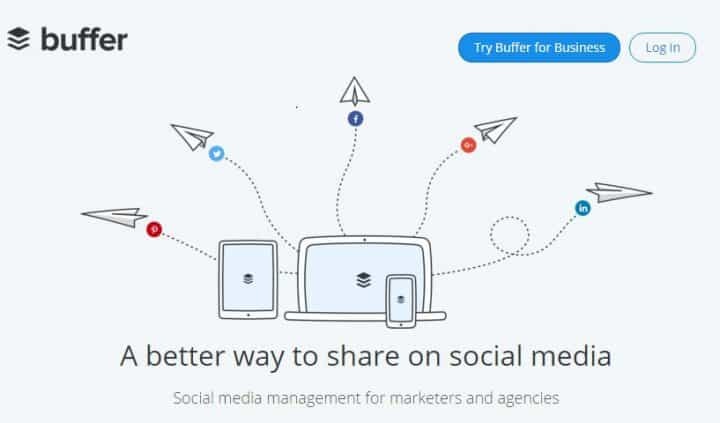 BufferApp is a great example of how a product can be tied closely to the content strategy, and how the content continues to drive growth based on the quality of information that you are sharing. Creating a goal-oriented content strategy allows you to measure your success with internal analysis methods. As you establish the most important goals to reach with your content, you can monitor how much closer you are getting to those goals based on the receptivity that your content is receiving after being published. However, blindly hunting for leads based on a content strategy that believes in “volume” not “strategy” is going to feel scattered, without any clear direction to follow. That’s going to be our goal for this guide, to help you establish a strategy that only takes a little bit of your time to set up, and allows you to start monitoring your content performance right away. The first step in your content strategy is going to be about creating a plan. You will need an actionable content plan that will complement your long-term business goals. We are going to discuss four individual steps of how to achieve the desired result. Those who have built content platforms before can usually avoid the first step. The first step in your strategy is the outline. An outline of what is going to be the purpose of your content, and how it is going to reflect the future goals. Once you have an outline, it becomes easier to move to the next step; creating goals. What’s the purpose of making content? What are you promoting with content? What’s the content we require? Where does your audience consume content? How are your competitors promoting themselves? What content do you have to work with already? How to make our content convert? What kind of content works best for you? How much work can you, or your team put into this strategy? Have you made an editorial calendar? What are your content promotion plans? You can save this “content framework” for future use. It’s a reusable outline of what a content strategy’s foundation needs to look like. The more clear are your answers to these questions, the more aligned you are going to be with your strategy. Think of the outline as the foundation of your home, without foundation, your home is going to collapse. You might think to yourself: “what’s the next step?”, the next step is to write down the most important part of your content strategy: what is your goal going to look like. If you have a marketing goal written down, and you stick to it, you can always come back to this same goal and check how well you are doing. You can measure your success by measuring the performance of your goals. If you find yourself moving away from a goal, reassess and try again. If you are getting closer to a goal, keep doing what you have been doing. What gets measured, gets done! Goal #1: — Generate a total of $10,000 in revenue during the course of next 12 months. Goal #2: — Establish first-page ranking for the keyword “how to blog”. Goal #3: — Collect 500 unique email subscribers over the next 6 months. 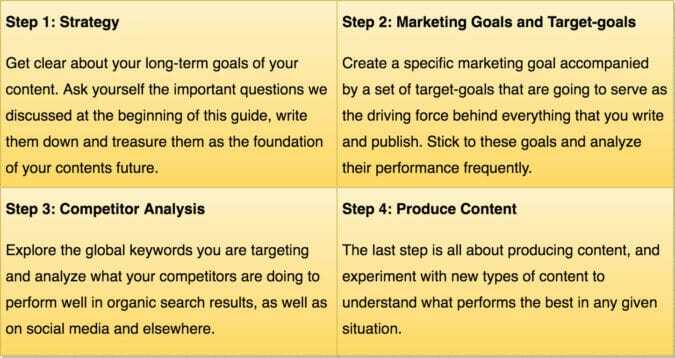 With such a thorough content goal strategy, you can begin to analyze how your content helps to achieve these goals. What other steps you’re going to have to take to ensure that these goals are going to be met. How will your customers reach the signup page from your content? How will you create content about the keyword “how to blog”? And what is going to be your main technique for acquiring new email subscribers? A content marketing strategy can seem questionable at first, meaning there’s a high volume of questions to answer. That is true. But, the more questions we can answer, the more solid our strategy is going to be. And a solid strategy allows you to analyze your content performance more effectively. As you spend time publishing new content, you gain access to data that helps you structure the future of your content, all based on content goals. If you don’t analyze what your competitors are doing, someone else surely will. In the example of our goals, we used the keyword “how to blog” — we can use the same keyword to do a thorough analysis. Google reports that there are roughly 15,000 monthly searches for this keyword, with an estimate keyword difficulty of “Medium” — which indicates that there is some competition for the keyword, and you will need to be very vigilant in becoming ranked well. 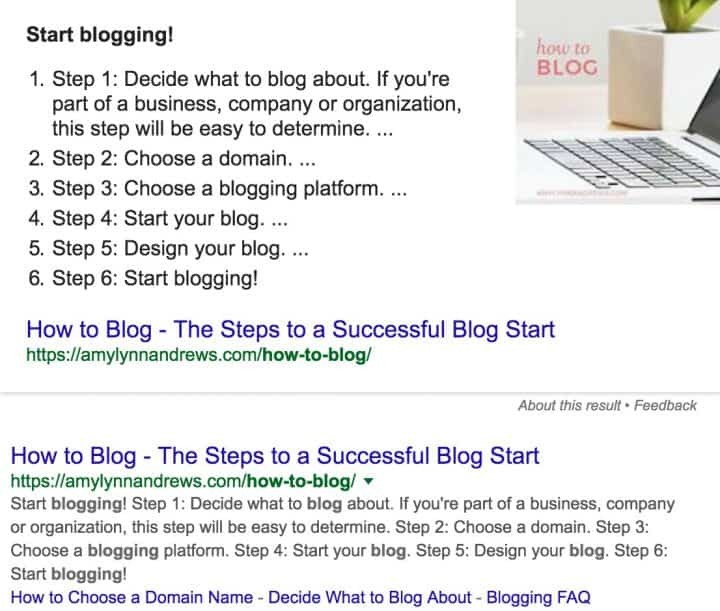 A search on Google for “how to blog” returns a very interesting first result from Amy Lynn Andrews. Her blog post shows up on Google’s Featured Snippets. Wouldn’t you want your content get similar attention, given that a case study has proven the increase in organic traffic when content is featured using the Featured Snippets. This is an important lesson in content marketing. Find out what is working for our competitors, and working in our competitors favor so that we can apply the same concepts to our content. In this case, Amy Lynn Andrews has produced a step-by-step content post that narrows down the question of “how to blog” in six simple steps. The description for each of the steps is concise, insightful and will greatly help an inexperienced blogger to get started on their blogging journey. In the same fashion, you can take this content-type (step by step guide posts) and apply it to the content that you are creating. Make sure you don’t get caught up in producing the same type of content all the time, include some variety and consistency. Not all of your posts need to be featured with Featured Snippets, a first-page result is already an amazing achievement. So far you have learned how to write a content strategy, how to produce long-lasting marketing and content target-goals, and how to analyze your competitors and what is making their content to perform well. I will not be talking about guest blogging, that is a matter of content promotion, and not in direct correlation of content strategy. Your last step is also where you begin to learn how your content is performing against your set goals. Having all the strategy points in place isn’t going to be of use if you aren’t doing anything to challenge them, meaning that the sooner you get to writing content and publishing, the sooner you will have new data to analyze, and understand. I’m happy to answer any questions and give more concise and thorough advice for your strategy, depending on what your current marketing situation is. Thank you for learning more about content strategies, and I hope to see you in one of our next posts. 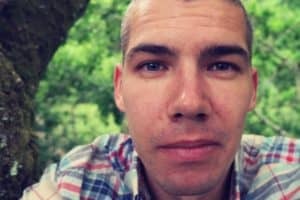 Author Bio: Alex Ivanovs has been helping brands and businesses achieve optimal content marketing results for the past 3 years. His portfolio includes the launch of several successful content marketing projects that have become household names for their particular industries. Currently, Alex is working at Colorlib as a Manager; overlooking content, and general marketing related activities.